There was a quick correspondence and before I knew it, I was on train to Philly on a Tuesday afternoon. 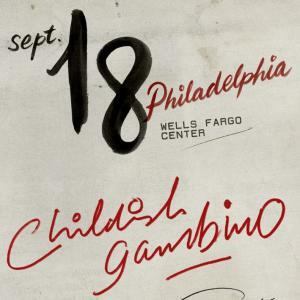 Donald Glover, aka Childish Gambino, was playing a concert at the Wells Fargo Center and I had a free ticket. I wasn’t sure what to expect, as I had never been to a concert at an arena like that before, but I expected it to be impersonal and not any different from my average concert. I have never been more pleased to have been wrong. This concert was truly a spectacle. There were lights and lasers, a live band, backup dancers, and a gospel choir. After years of only ever going to smaller, general admission concerts, I now understand the appeal of a massive show. The production quality was just out of this world amazing. Childish had a distinct live sound, and his music played with a live band had character I had never appreciated in his recorded music. He played some classics and he played some newer tracks, and they all flowed together perfectly into what was borderline a religious experience. As “Spirits” played, Childish was lifted above the stage, with a beam of light coming from the ceiling shining down on him. He immediately went into “This is America,” which was exciting to hear after thoroughly enjoying his new video for it! After this, he went into his encore, which was a perfect selection of some of my favorites from a variety of albums, “Sober,” “3005,” and “Redbone”! Almost more than my poor heart could handle! Going in, I purposely did not look up the setlist so as to not be disappointed, but I was pleasantly surprised to find out that he played more than just tracks from “Awaken, My Love!”, his most recent full length album. Childish truly puts on an amazing show, he is an actor, a performer and a singer, and all of those come together to form a stage presence unlike any I’ve ever seen before. He has the voice of an angel, and the religious undertones gave the concert feeling. If this is really his last tour ever, I am so sorry that not everyone will get to experience the amazement that I experienced. If we’re being honest, I was almost brought to tears. I was with my best friend and it was beautiful and we hugged and I almost cried. Childish Gambino’s self-proclaimed last tour ever was truly one of the most entertaining and visually and audibly appealing concerts I have ever been to. I’m so glad to have had the opportunity to go!